This morning, the SeeClickFix team was on-site in Houston, TX as Mayor Annise Parker announced the launch of the city's new SeeClickFix powered Houston 311 smartphone app. Available today for iPhone and Android, the application is the first of many innovative upgrades the city will be adding to their 311 Houston Service Helpline. The City of Houston is currently the largest city to partner with SeeClickFix and offer residents our mobile tools for resolving issues, increasing engagement, and improving communication between citizens and their local government. On behalf of the entire SeeClickFix team, we want to thank the many users in Houston who adopted our platform to improve their communities, long before we partnered with the city. We would also like to thank everyone from the City of Houston involved in this project. The hard work from all who dedicated their time and efforts towards making this application a success is greatly appreciated. All of us here at SeeClickFix are thankful for the opportunity to continue to strengthen our relationship with the City of Houston, as well as the opportunity to serve Houstonians using the Houston 311 application to improve their communities. Read more about the newly launched Houston 311 app in the city's official announcement below and be sure to check out local coverage of the Houston 311 application launch on ABC 13 and CBS Houston. Houston, TX (January 29, 2013) - Today, Mayor Annise Parker joined the City of Houston's 311 Help & Info to launch the all-new 311 Smartphone app. The Smartphone app is the newest addition to 311's entirely new design focused on maximizing citizen engagement. "I am excited to join 311 today to announce the redesigned 311 Help & Info," said Mayor Parker. "The old 311 was inefficient and failed to meet Houston's needs. The new 311 is a completely transformed entity which places focus exactly where it should be; on the customer. Today, Houstonians can reach 311 through a variety of channels that are convenient and easy to use." The City of Houston launched the 311 Houston Service Helpline in August 2001 as a telephone helpline, and the technology backbone which ran the system became rigid and inflexible over time. Now, 311 Help & Info users are able to submit service requests via the new Smartphone app, the redesigned website, email or by calling the 24/7 call center. The new 311 system is more flexible, convenient, efficient, and customer-focused than ever in Houston’s history. Additionally, the new 311 empowers citizens to join the City’s effort to improve the community by making it easy for them to report issues that need to be resolved. "I am so proud of where 311 is today and look forward to where it's going in the future," said Frank Carmody, who oversees 311 Help & Info. "We want to hear from Houston's citizens and we are working to create as many avenues as possible to allow them to communicate with us on their terms: When they want, how they want, and with whom they want." Prior to 311's transformation, the 311 Call Center provided telephone Service Request and information service 18 hours a day, seven days a week. Due to budget-required layoffs in FY2012, 311 had to stop offering service on the weekends. As of August 15, 2012, 311 Help & Info launched 24 hour a day, seven day a week service. Additionally, 311 installed a labor model that more closely matches the demands of Houstonians. Furthermore, the service extension was implemented at an operating cost to the City of $600,000 less per year than the former 311 Call Center model. In addition to expanded call-center hours and the new Smartphone app, 311's redesigned website, www.Houston311.org, enables Houstonians to easily submit a request for service online. For example, the 311 website only received 2,144 "hits" in January 2011. 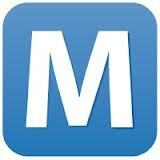 In January 2013, following its redesign, the website received more than 13,485 "hits." Over the past week, 311 has also launched a new interactive mapping tool that allows Houstonians to track the progress of their request and view other requests in the area. "The work that went into building these new customer tools really epitomizes the City's approach to customer service," said Parker. "A cross-functional team comprised of executives from my office, the Public Works & Engineering, Information Technology Services, Planning, and ARA departments worked together with a vendor, SeeClickFix, for months to bring these new services to the public. The result captures how I expect us to serve our citizens: we use one simple, convenient doorway into the City, an effective communication and coordination system, and thousands of workers from many departments are called to action. We can now provide a way for Houstonians to see our follow through. We have created the ability for citizens that fund these services to track where and when the City responded to their request." "It is because of our agents' dedication to customer satisfaction that 311 continues to become more and more successful every day," said Carmody. "When a citizen reports a problem, they can rest assured their issue will be reviewed. In fact, the City stands firmly by its high-level service agreement which requires the completion of every service request within a certain period of time." The recent 311 upgrades improve two-way communications between the City and its citizens, resulting in drastically higher engagement by Houstonians. However, the City's 311 Help & Info leaders work constantly to expand and improve 311 functions to better meet Houston’s needs. In addition to other future plans for 311, including the launch of a call-back assist program and SMS texting service requests, the next versions of the Smartphone app and website map tracking tool are already being designed. "Today is really about re-introducing Houstonians to 311 Help & Info," said Parker. "This new Smartphone app and newly redesigned website marks the beginning of many upgrades to come. The nature of technology in our society today is to iterate and improve, and the new 311 will not be an exception to that." The SeeClickFix team is thrilled to announce our partnership with the City of Winston-Salem, NC and the launch of their new CityLink 311 app for iPhone and Android! Check out the city's announcement below to learn more about how Winston-Salem residents now have the power to report public space concerns right in their pocket. The CityLink 311 app for iPhone and Android is available for download today! Winston-Salem residents can now contact CityLink, the city’s 24-hour citizen service center, with the new CityLink 311 mobile application for iPhone and Android. The app is available for smartphones and tablets. The CityLink 311 app uses GPS to automatically report the location for the service request. Users can report a different location if applicable. The app also allows citizens to take a photo and submit it with their service request. Reports are automatically sent to city departments for resolution, and with the app, users can follow their issue from the time it is reported until it is resolved. First-time users must register so that the application can follow their request. It also gives CityLink agents the ability to contact the citizen if they have a follow-up question about the request. For more information about the CityLink 311 mobile app, call CityLink 311. As Director of Citizen Engagement you will be tasked with cultivating and fostering a strong online community that is respectful to one another and works collectively at a local level to improve their communities off-line. Moderating and guiding local communities online to make a real difference in their community offline will be your main focus at SeeClickFix. The right person for the job will be patient and optimistic and know how to translate that ethic into written and verbal form. You need to be able to turn an upset user into a user for life. While you don’t have to have worked at a start-up previously you need to be prepared to work at a start-up. What does this mean? Start-up culture and SeeClickFix culture is one of dedication to the community over everything else. You must be prepared to carry weight for others and take on tasks outside of your typical responsibilities when needed. You need to be ready to be as important to the organization as the founders. SeeClickFix’s hierarchy is flat and everyone in the office is an equal decision maker. You will be involved in conversations about features and have a vote on matters related to the platform. To start this post we need to reiterate that calling 911 in an emergency should always be done prior to posting on SeeClickFix. As this issue documents, you create a lot of value created by calling 911 and then posting on SeeClickFix. In this case, the issue did not necessarily constitute an emergency to the reporter and he was unsure if 911 was the appropriate channel. Thanks to an open conversation we all received insight into a rare, potentially dangerous event and learned how to handle it going forward. Ever heard of "Stray Voltage"? Neither had we until this post, but it's real, and it can kill a human if unaddressed. On Wednesday, a dog walker and SeeClickFix-er, "Concerned Resident," reported an unusual issue that he had suspected for some time but was not able to put his finger on until he chatted with another dog walker in the neighborhood. Last year, "Concerned Resident"would walk his old dog by Grove Street Cemetery until one day the dog yelped and then later refused to walk on that side of the street. He was skeptical about what was going on and asked a few folks what they thought. The only explanation that anyone came up with was that there were "spirits from the cemetery." If any cemetery possesses spirits able to outrun the grave, it's this one. To give some context to individuals outside New Haven, there are some very powerful individuals buried in the Grove Street Cemetary. As a quick history lesson, notables buried in the cemetery include Walter Camp (the father of American Football), Noah Webster (publisher of the modern English dictionary), Josiah Gibbs (the father of thermodynamics), Charles Goodyear (inventor of vulcanized rubber), Jeddidiah Morse (father of American geography), Roger Sherman (a founding father and the only person to sign all four documents of American sovereignty), many Senators , Congressman and SeeClickFix's personal favorite, Eli Whitney (inventor of the cotton gin). "Concerned Resident" put thoughts about the cemetery aside until he started to walk his new dog. He was startled to find that this dog would not walk on that side of the street either. Recently he advised another dog walker to avoid that side of the street. The other walker replied that he already was avoiding that side on his dog's orders. In their conversation they raised the possibility of stray electrical voltage similar to the cause of death of Jodie Lane in NYC in 2004. Still skeptical that this was the case, they were hesitant to call 911 and so "Concerned Resident" posted on SeeClickFix, Potentially Life Threatening Voltage Leakage On Sidewalk. Fortunately, New Haven has a host of responsible civil servants who chimed in to assist: the Livable Cities Initiative, The Emergency Operations Center and the Chief Administrative Officer. The Fire Department was notified immediately. This reported issue has been reviewed. An immediate response to this has been initiated. Anything involving an immediate threat to life, health or property, please call in to 9-1-1. Emails and SCF issues should be for non-emergency issues. I just received an email from the site planner's office, forwarding the electrical contractor's confirmation that they had inspected the site, and indeed had found and corrected a mechanical defect that was creating stray voltage on the sidewalk on College(Prospect) Street, beside Grove Cemetery. Thanks to Malinda Figueroa at the City Engineer's office for starting this chain of actions, and to anyone else on this site who also tried to help. I am very happy that the problem was found and fixed before anyone (or any companion animal) was seriously injured. Again, thanks to all. Apparently stray voltage is a huge issue in NYC as reported in this piece from the New York Times. One organization has already started mapping all of the reports of stray voltage attributed to Con ED. Some of our friends in Boston have already created a very cool app called Street Bump that reports potholes when you hit them. Our new challenge to the civic geek community: an app for your companions that let's them report stray voltage. Come on, Code For America. We know you got this. Post Script/Meta: There is a lively conversation on this issue about 911 vs. SeeClickFix. The short answer is that there is never any harm in calling 911 and usually more harm in not doing so. In this case SeeClickFix served two purposes. 1) A citizen that would not have spoken up otherwise because he was skeptical that 911 was the right channel found out that he was reporting an emergency issue and that 911 was definitely the right channel. 2) The 250+ citizens who have already seen this issue have learned about stray voltage and the proper way to report it to the city. This is another big win for open communication and proactive neighbors. Thanks to the City of New Haven which continues to be look out for us when we need a hand and to our neighbors who are looking out for the City of New Haven. Our dear friend Ian Christmann of Catalyst Studios helped PBS out with a photo shoot of the SeeClickFix office for a series on News Hour called Agents of Change. 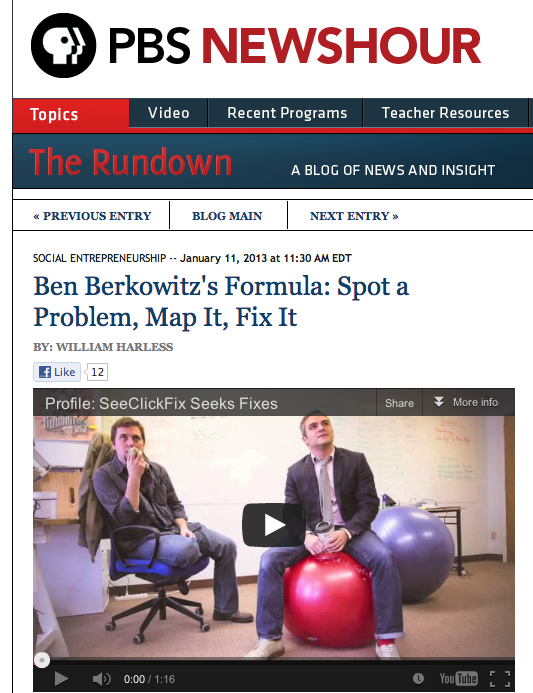 SeeClickFix was the only tech company featured in a collection of stories about social entrepreneurs. Greta, Dan Bernier, Kam and Jeff were all featured in the slideshow. The story focused on SeeClickFix from my perspective as that is the format of the series, but the story is really about the company and the platform. 24 hours after the mitten was reported missing EWG chimed in. 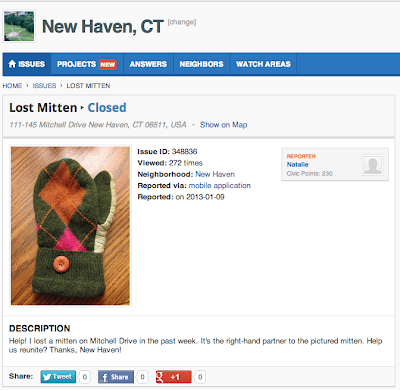 To follow is the story of the successful return of Righty the Mitten. While we could easily chalk this story up to #FirstWorldProblems there is a bigger story to be told here. In a hyper connected neighborhood we all stand a better chance of helping each other to solve our own problems collectively big or small. Righty the Mitten could be Pepper the Dog or Your Dad with Alzheimers but the message is the same: your neighbors are there for you and your community is stronger for it. 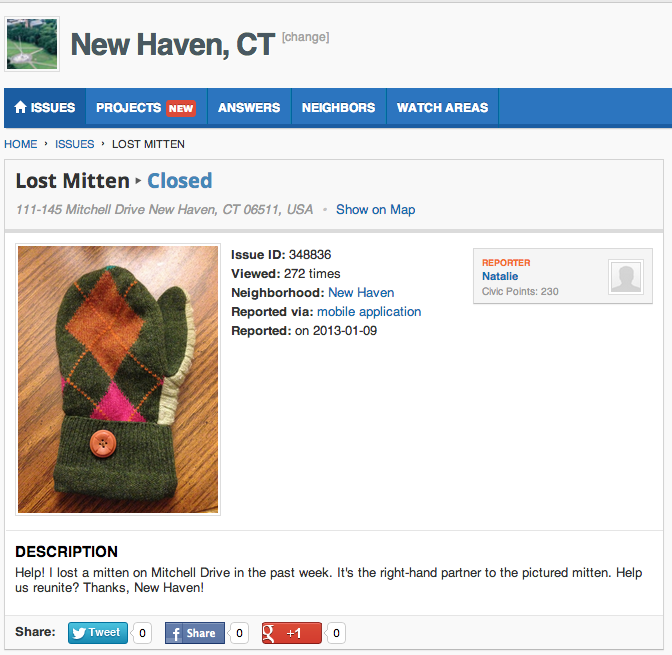 From the neighbor who returned the gloves facebook wall, "Returned a mitten to its rightful owner this morning. Feeling very cheery about neighborhood life as result." There's a number of folks smiling a little more in the SeeClickFix office as a result of this story. We hope you enjoy it too. The way that EWG found out about the Mitten is through what we call Point of Interest emails at SeeClickFix. When EWG interacted with another issue in the neighborhood we make an assumption that she probably cares about other small issues nearby that issue. These emails create a network that is defined by geography. What's important and unique about the network is that the geography is not assigned by artificial neighborhood boundaries, its assigned by an individual's behavior. On a higher level we believe that the fuzzy and individual overlaps that occur in this network have the power to disrupt the physical boundaries in the real world that divide us. In a city train tracks or overpasses make neighbors separated by a city block feel like they are separated by 10 city blocks. For those that live on the fringes block groups, policing districts, neighborhood schools and aldermanic wards can all strengthen boundaries by preventing communication overlap. Intersections can be created on the web where none existed before but should have. Every time SeeClickFix helps get a pothole fixed, it proves that democracy can work on Main Street as well as K Street, and a lot less expensively. Municipalities spend about $10 handling a 311 call about a pothole. SeeClickFix can cut that cost to close to zero by delivering to City Hall, via jaw-rattled citizens, GPS-pinpointed information about new potholes plus digital photos of the road damage. Municipal staff can then mobilize resources to fill each pothole rather than spending 15 minutes trying to calm an upset motorist or cyclist. What’s in store for SeeClickFix in 2013? 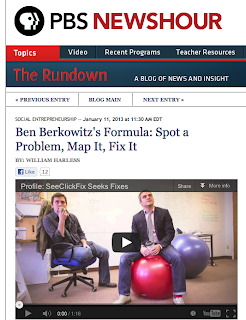 We caught up with cofounder Ben Berkowitz over email recently to find out. SeeClickFix will be entering its sixth year in March. Has time tempered your excitement about your mission and potential since your launch in 2008? Not all. Should I be concerned? Does this make me a fanatic? In all seriousness, our users keep surprising us with use cases, the site continues to double content creation year over year, and the number of governments paying us to help them save money and increase engagement in their communities is tripling every year. The party is just getting started. Would you update the numbers? How many cities and towns do you have relationships with? What’s your annual fix rate? How many issues have been resolved? How many news partners? There are 135 client cities and tens of thousands receiving alerts. Sixty-six percent of issues reported in the last year were fixed. That trend continues upwards. We have around 1,000 news partners. We have really started to focus in on the government partnerships more than anything as that’s where we see the most growth and the company is really performing well in that sector. Do you plan to launch any specific major innovation in 2013? In 2013 we will launch our social question-and-answer knowledge base, we will have our first clients adding other open data feeds to their mobile apps, we will have users crowd funding repairs and will generally will continue to step up the user experience. Sales, marketing and engineering will all grow dramatically at SeeClickFix in 2013. Our biggest focus will be in harnessing the amazing community we have already built to bring in more folks and make neighborhoods even greater. Read the entire piece by Streetfight. We just had our first coyote report in New Haven on SeeClickFix. I tweeted the internetz with w the find and our ever lovable pal @JSB from the Knight Foundation responded back with this article about a thriving urban coyote population in North America. This morning the Toronto Star's fixer column, powered by SeeClickFix, reported on a coyote deer attack in their daily column. Interest peaked I did a quick data dive on SeeClickFix into the reported coyote population. I was surprised with the number of reports that were out there. In 2012 there were 50 coyote related reports in North America; double the total number of coyote reports from the three years prior combined. The number of total issues created on SeeClickFix has roughly doubled from the year before so its fair to say that the data reflects the general trend that urban coyote's are on the rise and encountering people more frequently. As wildlife returns to many of our urban areas it will be interesting to see what else pops up in the data. Highlights from 2012: SeeClickFix's Best Year Yet! 2012 has been a remarkable year for all of us. Around the world our friends and neighbors have been actively engaging in their communities and taking real action to make their neighborhoods better. Citizens, municipal workers, elected officials, small businesses and utilities have brought the annual fix rate to an all-time-high of 66%. Over 200,000 issues have been resolved as of this month. Together you have openly discussed your concerns and worked with your neighbors and governments to resolve them in a way that makes the most sense for your neighborhood. Our municipal users deserve an extra big hand this year as 2012 was the year for embracing open communication and customer service in government. 135 cities and towns from Canada to Australia now use SeeClickFix as their primary web and mobile communication channel and thousands more are actively responding to requests. More and more we see harmony between the way the SeeClickFix community wants to communicate with their local governments and the way that local governments want to communicate with their community. Here's some of our highlights from the year. If we missed something awesome let us know and we'll post it on the blog or the facebook page. The SeeClickFix Dashboard is now being used by 135 City Clients and includes a boatload of new features including the ability to assign and re-categorize issues, create work orders and generate beautiful reports. We have whitelabeled our marketplace mobile applications for a number of cities and one State so that the app is searchable under their brand and keywords. This month we also released the ability to add additional information pages to your custom application dynamically through our easy to use content management system. We have started to test a knowledge base and question and answer platform in select cities to help citizens and governments learn from each other in a scalable way that saves money and easy to implement. Two cities have already signed on for early launch and we’re still accepting early adopters at a discounted rate. We are also starting to experiment with crowdfunding and have helped to successfully fund a few projects in New Haven. The Cities of Minneapolis and Oakland have been longtime users of SeeClickFix and this year both Cities launched deeper integrations with the platform and became clients. In Minneapolis we launched marketplace mobile applications for the city and in Oakland we integrated with their CityWorks Work order system. Richmond, VA, Surrey British Columbia and a number of other towns also became clients of our CityWorks connect offering. Washington DC also launched their marketplace mobile applications with SeeClickFix and have done a tremendous job marketing the apps on subway posters and parking meter stickers. We also launched connections with Chicago 311 and Toronto 311 and assisted many small towns and FEMA during Hurricane Sandy. As a result of the Toronto 311 connection we also launched our largest media partner the Toronto Star who just listed SeeClickFix as the best thing they’ve done all year. All in all 15 Million new citizens were affected by these new relationships around the globe. The new year will start off with a bang as well as we launch marketplace mobile applications and integrate with Houston’s CRM Kana, an integration with Oracle in Albuquerque and with 35 towns in Massachusetts through the Commonwealth Connect application that we have built for the State. There also were a number of deals signed at the end of 2012 from California to North Carolina that we have not let the cat out of the bag yet on. Stay tuned for those! The Long Awaited Left Turn: A persistent Mom improved the safety of an intersection near a school after a year of work. Giving a Hoot: An owl family was saved thanks to a diligent Park Ranger. Spring Cleaning with SeeClickFix: A town in Canada uses SeeClickFix to coordinate its yearly clean up efforts. As the first full-time employee at SeeClickFix the most remarkable thing for me has been watching the growth of the team to fifteen full-time employees. Those 15 folks are dedicating their lives to helping you make your neighborhoods better. If you want to help them we’d love it if you would introduce SeeClickFix to your neighbors or your local government. If you are in local government we’d love to show you all that has been built in the last year. We think you’ll like it. You can email me or contact the team at contact@seeclickfix.com. Happy Holidays and here’s to collaboratively improving neighborhoods in 2013! "Since Macon began taking basic service calls through web-based SeeClickFix, requests for city work have gone up by 20 percent, according to Amanda Deaton, assistant chief administrative officer for budget and planning. That’s fallen most heavily on the Public Works Department, which already got the lion’s share of requests. Despite the increased workload, responsiveness apparently hasn’t suffered; and if anything it’s improved..."
"Sapp put in the SeeClickFix request on a Sunday evening. As he was on his way to work Monday morning, a Public Works employee called in response. The worker was already in the alley, preparing to cut down the tree, Sapp said. 'He couldn’t have been at work 10 minutes before he turned around and checked it out,' Sapp said." Sapp isn't the only Macon resident who likes using SeeClickFix. Of 882 reports made in November, 80% of them were closed before the end of the month. We're thrilled to see how successful SeeClickFix has been in Macon! In August we flew to Berlin to accept an Urban Innovation award from Mashable and BMW. 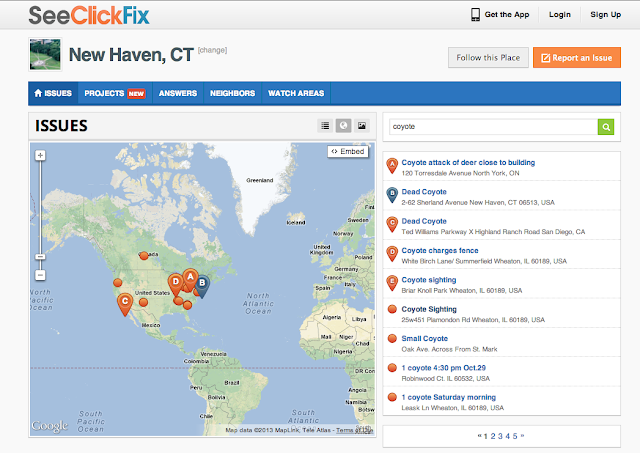 This week the blog giant has listed SeeClickFix as one of the 35 Urban Innovations to watch for 2013. We were listed alongside a number of notable projects worth checking out including the Chicago Tech Academy, apps like WAZE for getting around town faster and of course our personal favorite Code For America. Mashable has done a great job of documenting the growing pop nature of urban innovation. In a time when massive corporations like Philips, software start-Ups Like Waze and small kickstarter projects like softwalk are all working to make our cities more livable places it can be hard to keep up. Thanks Mashable for being on the pulse. Here's to 2013 being the year of Urban Innovation. 2012 was a banner year for us, here at SeeClickFix HQ. If you've been following this blog, you already know we have a lot to be thankful for, in particular on the Government side. On the Media product side, we couldn't be any happier to have forged a partnership with the Toronto Star, who re-launched the 8-years-running civic issues column The Fixer on the back of SeeClickFix. And the introduction of SeeClickFix as a new way to simultaneously report issues to us and the city qualifies as the best thing we did in the past year to assist our readers. Right back at you, Jack! We all look forward to helping the Toronto Star "fix" many more civic and community issues reported by readers, such as this obstructed bike lane that was just resolved today. Happy New Year, Toronto! Keep on reporting.